Caring for our stems is just as important as caring for our pipes; yet care is often focused on preventing oxidation and keeping our stems shiny on the outside. But what's going on inside the airways? 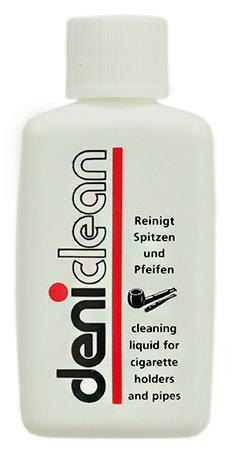 Luckily, there's Deniclean: a cleaning solution designed to aid in preventative care. Simply dip a pipe cleaner into the solution and run it through the mouthpiece. Adding this simple step into your post smoke ritual can help keep your airways from becoming blocked and ensure general cleanliness. Ottimo prodotto per migliorare la pulizia quotidiana delle nostre pipe. Velocemente e senza fatica il bocchino risulterà pulito e senza sgradevoli odori e la fumata successiva sarà migliore. Consigliato!